What hits the spot for you? Is it something greasy or clean? Creamy or crunchy? Juicy or crispy? Maybe the best of both options can sate your cravings and for some, that means digging into the unique snap of Korean fried chicken skin and reaching the succulent meat beneath. There are several places where you'll find that version of "KFC" in Orange County but the newest player on the scene might have that recipe down pat. 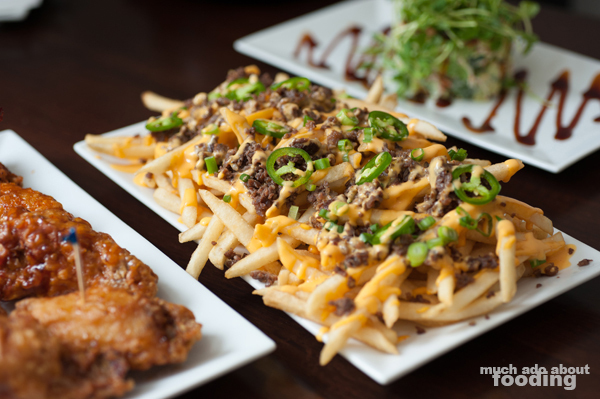 Krave Asian Fusion has nestled itself in Irvine near the infamous Diamond Jamboree Plaza but slightly offsite so you don't have to deal with the horrendous parking nightmares that plague that zone. They not only feature some finger-licking chicken but also showcase a few other tasty treats that you might want to get your hands on. 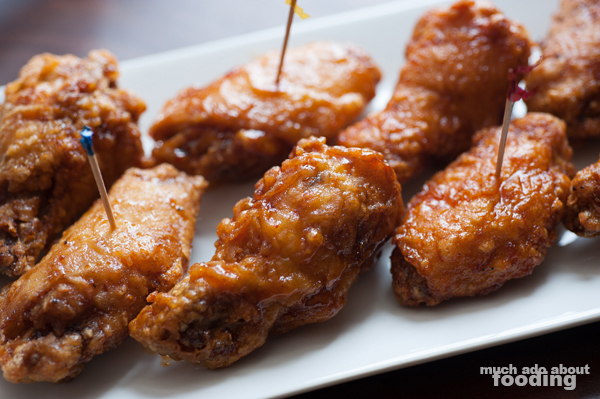 We were invited in one afternoon to check out what they had to offer, and we have to say that we just might have to come back for those wings indeed. Owner Will Chen started Krave out of a personal love for food and cooking, naming the restaurant after the idea of craving food and the tribute in the "K" to Korean fried chicken. Began with a goal to make the best KFC available, the restaurant also pays attention to its ingredients. 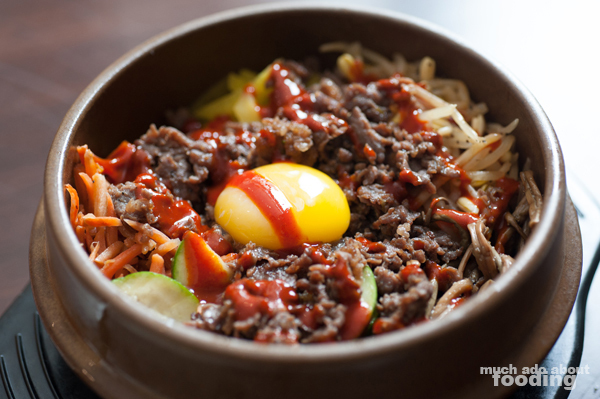 The chicken used is free of preservatives and additional hormones; the bulgogi is made of ribeye steak for its cut. We were able to try that afternoon some of Will's own favorites which were the Kogi Fries, Salmon Avocado Salad, and KFC wings with black peppercorn glaze. Predominantly Korean and Japanese in cuisine, the menu will shift in the future to include more diverse Asian cuisines such as Thai and Taiwanese. Personally, we began with the Salmon Avocado Salad ($10.99 - Persian cucumber, tobiko, crab stick, and pea sprouts) as we've been trying to be more mindful of our dish choices...but then Duc couldn't resist the Loaded Kogi Fries ($9.99 - Sriracha cheese sauce, marinated ribeye, scallions, and jalapenos) because of the description. 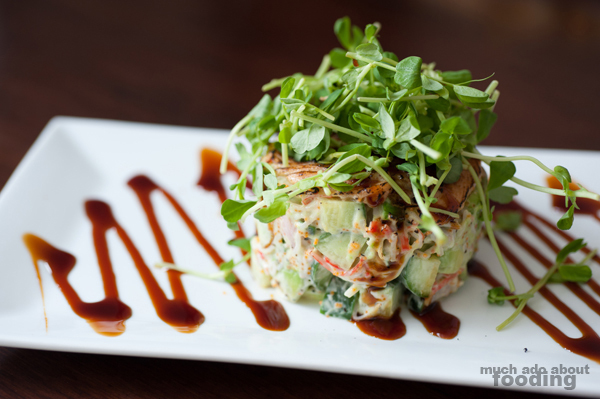 The salad was artfully presented as a molded tower of all of the ingredients atop a plate drizzled with what seemed to be a thick soy sauce-based glaze. We were slightly surprised that the salmon for this salad was just a thin layer atop a primarily cucumber and crab stick cylinder but what pieces we had of it were tasty. It reminded us of the torched slivers of salmon that come with sushi rolls, slightly grilled and pounded flat. Personally, I was not too ecstatic about all of the binding creaminess that kept the salad together but I did really enjoy the hearty heap of pea sprouts accompanying everything. As for the fries, they were certainly intense in size, a plate meant for sharing among more than just two people. The French fries beneath the helpings of beef were a perfect balance between crisp and starch, and we really enjoyed the copious slices of green onions around. The cheese sauce didn't come off as much of a blend with Sriracha though but the jalapenos made up for any heat they wanted to include. 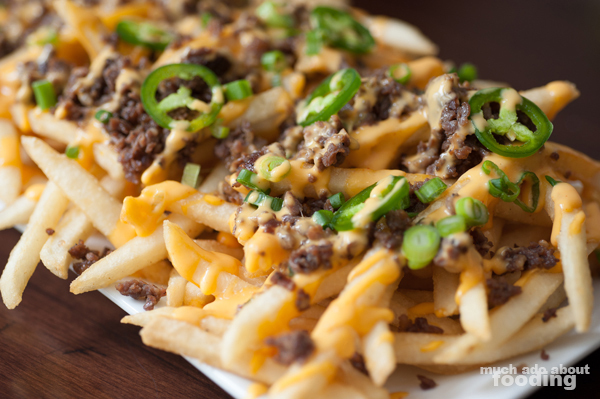 Make sure if you order this that you have a backup plan lest you cannot finish - I can attest from personal experience that reheating these does not result in as great of a crunch to the fries, if any. Once the appetizers were sampled, we decided it was time to get to the main shows. We had seen several people already talking about Krave's Bibimbap ($11.99 - hot stone rice bowl with seasoned vegetables, marinated rib-eye, and egg) since its opening so we just had to give it a shot. Since we live near to Koreatown, it was only appropriate to see how their version stacked up to the others we knew of. Krave's bibimbap had quite a lot of elements we really enjoyed in it, particularly how beautifully the rice did crisp up at the bottom and how the whole dish was presented. The red chili paste that came with it all was in-line with what we have loved about bibimbap as well; I only wished that there was a slightly more prominent appearance of sesame oil. Overall though, good dish that is priced well, especially during the lunch specials when you can snag it for just $8.99. Next up, seeing as Krave specializes in Korean Fried Chicken, it was time to see what their KFC was all about. A small order of 10 wings/5 drumsticks/8 piece combo will run you $11.99 while a medium (20/10/15) goes for $21.99 and large (30/15/23) goes for $29.99. These pieces are glazed in your sauces of choosing: Soy Garlic, Black Peppercorn, Chinese Chili, or Spicy. We got to try out a little bit of each and had differing opinions on how each ranked. Suffice it to say, the spicy has quite a bit of a kick to it so beware. Otherwise, we both really did enjoy the soy garlic glaze; however, it is definitely up to you which path you want to take. Maybe you should give each a try! They were perfectly crunchy where they needed to be while also maintaining a juiciness in the meat that not all chicken spots can achieve. The different sauces made a different with each taste as well, and we were surprised at just how the wings and drumsticks just crackled beautifully with each bite. Bravo to what Krave's managed to achieve already in their short open time - a competitively delicious Korean fried chicken dish. To round out the afternoon, we just had to try out their Ice Cream ($2.99) because of the unique flavors listed and what our waitress told us about it. 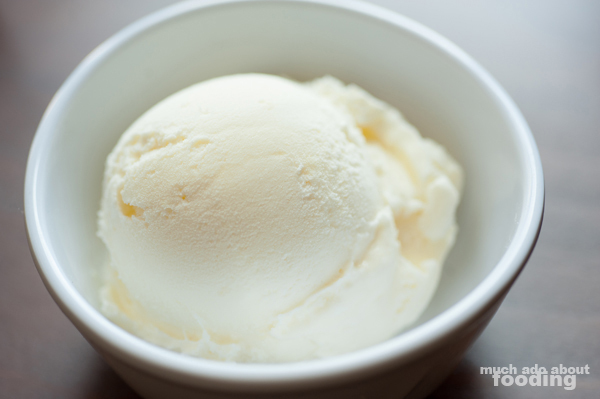 Sourced locally in the San Gabriel Valley, the ice cream leaned toward Asian-dominant flavors and therefore piqued our interest. 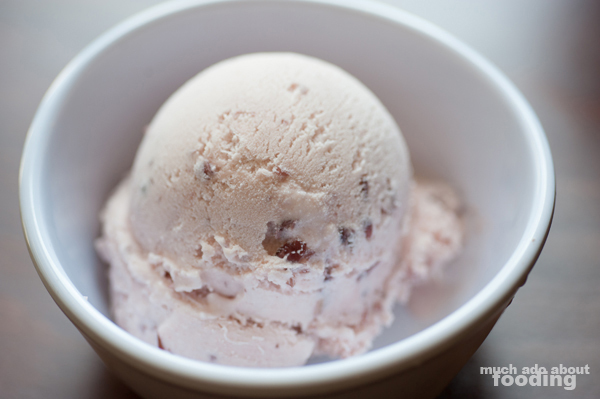 We tried for the red bean and ginger versions, both incredibly creamy and smooth without the crystallization that some ice creams undergo. They were superb and certainly made us want more! It will be interesting to see how Krave continues to evolve from this point. As a relatively new restaurant, they definitely have plenty to think about at their initial homestead but their quality of KFC makes me hope that they will expand and spread the tasty KFC love. If you want to get a bite in, check them out at 2819 Main Street, Irvine, CA 92614 and make sure to get your chompers onto some KFC right away.